This PDF 1.3 document has been generated by PrimoPDF http://www.primopdf.com / Nitro PDF PrimoPDF, and has been sent on pdf-archive.com on 17/01/2017 at 14:37, from IP address 193.186.x.x. The current document download page has been viewed 218 times. File size: 233 KB (7 pages). which could avoid bias to recall or precision value. Experiment results show that the proposed approach is effective. 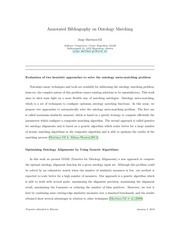 Keywords: Ontology alignment, NSGA-II, aggregation of similarity measures. 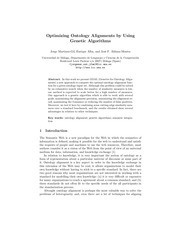 addressed by techniques like genetic algorithms. avoid bias to recall or precision value. conclusions and propose further improvement. semi-automatic matching systems have been developed. are based on genetic algorithms. meet the diverse requirements of alignment. populate the domain of interest. between the concepts of domain. real world, representing the instances of a concept. correspondence between the entities e and e'. between the entities e and e'. ontologies: A'= (O, O', A, p, r). measures belonging to these three categories. distance  and Jaro distance . |s1| and |s2|: Is the length of string s1 and s2, respectively. common characters that appear in different positions. • 1, if the word w1 and w2 are synonymous. superclasses or subclasses of c1 and c2, respectively. s (c): Is the vector of similarity measure results. w : Is the vector of weights. n: Is the number of similarity measures. information retrieval field  in the next section. measures commonly known as recall and precision. number of additionally falsely identified alignment. not imply that all alignments have been found. bias to recall or precision. discussed in details in section 4. NSGA-II. First, the similarity measures are chosen. similarity during the process of running NSGA-II. four basic steps of NSGA-II are presented. weights and the threshold encoded in the chromosome. are obtained by mixing the genes of the parents. of them are switched to form two children. and if it is, the value of that bit is then flipped. presented in details in . precision than the first one. the matching between ontology classes and properties. Table 1. Brief description of benchmarks. • Levenstein Distance (Syntactic Measure). • Jaro Distance (Syntactic Measure). • Linguistic Distance (Linguistic Measure). • Taxonomy Distance (Taxonomy-Based Measure). of NSGA-II are recall and precision. have set a limit of five generations. • Processor: Intel Core (TM) i7. driven genetic algorithm in benchmark 301 and 302.
conventional genetic algorithm with elitism strategy. and even which similarity measures should be utilized. Principles Database and Systems, USA, pp. and Information Technology, Chengdu, China, pp. Databases, Hong Kong, China, pp. 610-621, 2002. Knowledge Management, Salzburg, Austria, pp. Databases Journal, vol. 14, no. 1, pp. 50-67, 2005. Information Technology, vol. 8, no. 2, pp. International Conference, Sibiu, Romania, pp. Applications, vol. 37, no. 5, pp. 3638-3646, 2010.
enza, Spain, pp. 251-263, 2002.
for the Semantic Web, vol. 419, pp. 31-45, 2008. Knowledge and Information Systems, vol. 26, no. Development, Valencia, Spain, pp. 17-26, 2010.
no. 11, pp. 39-41, 1995. Science, vol. 3730, pp. 146-171, 2005.
computation, data mining and machine learning. This file has been shared by a user of PDF Archive. Document ID: 00538099.